Pantasia: i-Slots - the slot machines with a story! Try the game that has doubled the entertainment power of slot games. i-Slots are multi-reel, multi-line slots that up the ante with amazing extras like animated video clips, interactive bonus rounds and storylines that unfold over the course of the game. Best of all, your choices and skill control the outcome of each round, so i-Slots are different every time you play! A crime caper where it's you against the coppers. 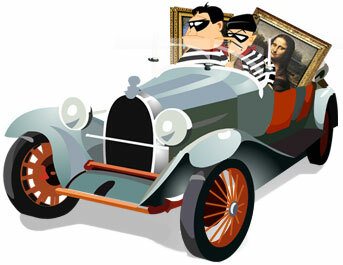 You join two art theives on their quest to steal famous paintings. This new game's bonus round blasts straight into outer space with a classic arcade feel. Take your gaming to another world and navigate your Rocket Racer through inter-galactic caves. Test your golf game at the Hole in Won bonus round. The better your front nine, the better your score. Starting at your travel agent's office, travel around the world by air and ship. Re-write history by becoming the world's utimate guitar hero in this tribue slot to history's greatest rockers. The 60's hippie subculture is back but this time it's taking the form of a groovy new slot. Top Secret: Assemble a bomb in the first level and then decide which building to plant it in. Home improvement has never been more fun. Return the dilapidated old house back to its former glory. Hop in your time machine and take a trip back to the future in this time traveling adventure. Capture boxing heavyweight gold in this online knock-out with intense championship bonus rounds.